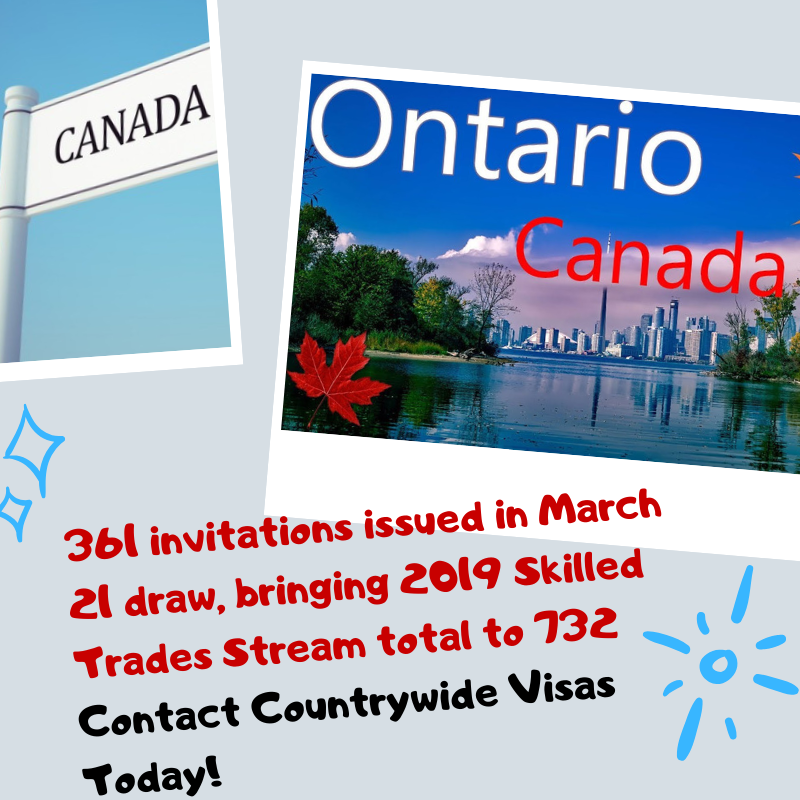 On March 21, 2019, the Ontario Immigrant Nominee Program (OINP) issued new invitations to 361 Express Entry Candidates to apply for provincial nomination for permanent residence in Canada through its New Skilled Trades Stream Draw. With this Draw, the total number of invitations to Express Entry candidates through Skilled Trades Stream is around 732 in 2019. This draw considered only those eligible candidates who have registered their profiles in Express entry pool between March 21, 2018, and March 21, 2019. So, if you want your profile to be considered for provincial nomination for permanent residence through the Ontario Immigrant Nominee Program, then you first need to enter your profile in Federal Express Entry Program. All invitees who get nominated for Canadian PR through OINP’s Skilled Trades Stream receive an additional 600 points towards their Express Entry score. For further information, feel free to contact experts of countrywide visas. Countrywide visas is one of the fastest growing Immigration consultancies with a large, devoted team of Immigration experts offers hassle-free and professional services to its clients for filing their applications for various immigration programs.